Thursday May 29th 1924 Rob is 41 years old today. Paul Anderson and sister here for dinner. Cora took Hattie, Fannie and me to ride in afternoon. Went to cemetery to decorate both lots. The Whinneys here for supper. Letter from Cousin Jen. Friday May 30th 1924 Was down to Fannies in forenoon. Wrote to Cousin Jen and Lydia. Hattie & I rode with Ott & Fannie most of the afternoon. The Whetstones away to picnic supper. Fine day. Sunday June 1st 1924 We went to S S and church with Ott. Lula Bloom Towns here. She and Cora arranged flowers there in Mothers memory. We rode in afternoon. I called at Aunt Emmas. Wrote William & Mary and Mattie Fletcher. Saturday May 31st 1924 Did some sewing in forenoon. Went to town to do errands. The girls to a luncheon. Met Hattie later and we went to picture show. Got me a new hat. 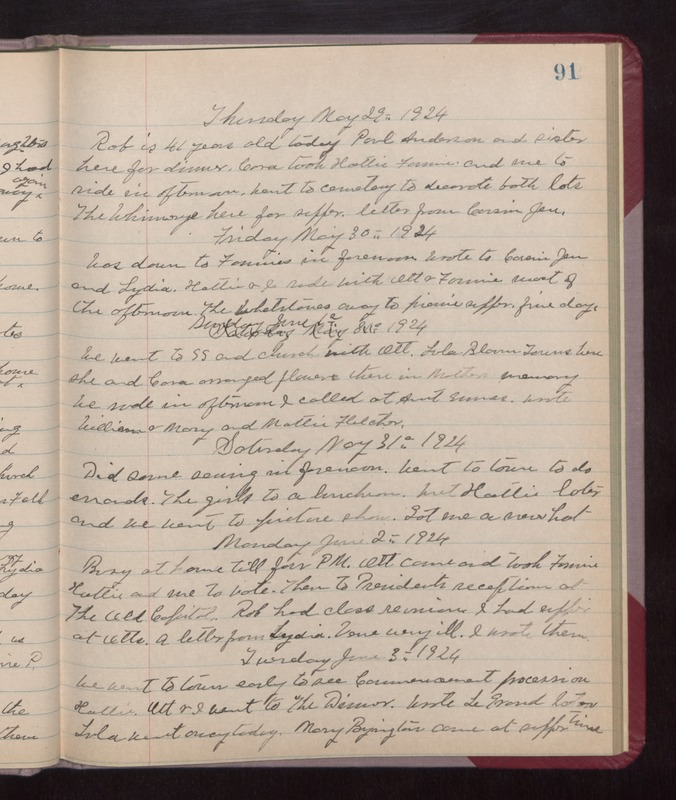 Monday June 2nd 1924 Busy at home till four PM. Ott came and took Fannie, Hattie and me to vote. Then to Presidents reception at The Old Capitol. Rob had class reunion. I had supper at Otts. A letter from Lydia. Vene very ill. I wrote them. Tuesday June 3rd 1924 We went to town early to see Commencement procession. Hattie, Ott & I went to The Dinner. Wrote LeGrand later Lula went away today. Mary Byington came at supper time.